Our theme for the 2016 to 2017 fiscal year of the National Society of Accountants (NSA) is Members First! The focus of NSA must be on its members—member service, meeting member needs, and members helping one another—because without members, there is little reason for us to exist. The true value of membership lies in whether the cost of the membership is worth the advantages that come from belonging to NSA. A CPA member from Maryland told me he belongs to NSA because he reads and values the daily report from Tax Talk. 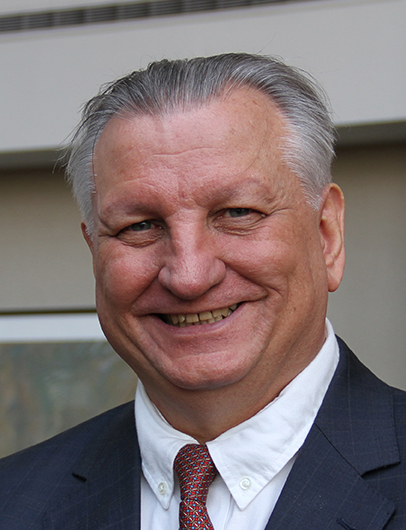 Another member joined to get the free five research reports from NSA’s tax research service. I belong to NSA because of the personal and business relationships that give me access to the professional opinions of main street (small firm) accountants all over the United States. For 71 years, NSA has taken a leadership role in protecting the rights to practice of all practitioners whether they be licensed, enrolled, or unlicensed. Whether you are a member of NSA or not, NSA fights to protect your practice. NSA’s Right to Practice (RTP) committee works with state accounting organizations and state legislatures to assist in the writing of legislation and regulations that protect the public and the right to practice of all tax and financial accounting professionals. NSA recently proposed a Tax Practitioner Bill of Rights (http://www.nsacct.org/tax/bill-of-rights). NSA has spoken with Internal Revenue Service Commissioner John Koskinen several times concerning this document. The NSA Tax Practitioner Bill of Rights is necessary to preserve the rights of not only the practitioner, but the US taxpayer as well. 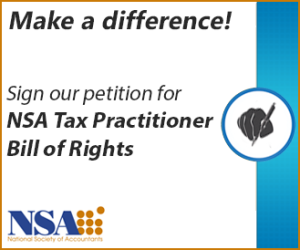 NSA will continue to fight for these rights for the benefit of all tax practitioners. The Education and Professional Development Committee and NSA staff are developing webinars and face-to-face seminars including a 1040 course Mohegan Sun Resort in Uncasville, CT and a possible post tax season seminar retreat. Preliminary plans also include a three-day Special Enrollment Examination preparation and Accredited Tax Professional course and a full slate of education at next year’s convention in Reno. The Leadership Development program is training future NSA leaders. The Accounting Standards Committees are working to keep the members informed of the many changes in tax and financial accounting. The Long Range Planning Committee is fleshing out plans to meet the challenges to our members in the next five to fifteen years. The Editorial Review Committee continues to seek relevant articles to publish, and is updating our online documents, resource files, letters, and forms. As members of NSA, we move into another year with purpose, dedication, and a willingness to take on new challenges and opportunities. Together, all of the members of NSA – the volunteers and our great leaders – will provide a vision for the future.